Morgan and I have officially stuck with once a month cooking for eight months now! Honestly, when we started I didn't expect to stick with it for as long as we have. But it really works well for our family, and I can now see us eating this way for a long time. Over the past right months, I've learned a lot about the process and we've fallen into a good groove. However, when I tell people we do once a month cooking, a lot of the same questions and misconceptions are brought up. So I wanted to bust some of those today! 1. You eat the same meal a lot. For us, this isn't true at all! We usually don't eat the same meal more than twice -- or occasionally three times -- per month. When we cook we make sure to split them into meal sized portions, so leftovers are minimal. Then, when planning, I spread the meal types all over the month so we have variety. I also switch some of the meals I'm using each month depending on what we're doing, the weather and what's in season. 2. You only eat crock pot meals. Not true at all for us! We eat more crock pot meals in the winter, but we would do that no matter how we cook. This month, I have three recipes -- or six meals -- that will be cooked in the crock pot and that's it. The rest will be done in the oven, on the grill or on the stovetop. 3. You save a tons of money on food. This is a "maybe" answer. We save a good deal of money, but not so much on groceries as we do on not picking up food for dinner. We always have something to eat so that make it easier not to run to a restaurant or grab fast food. But, groceries still cost what they cost. So, without couponing or buying at a bulk discount store, I'm not sure we save all that much on groceries. There is some savings by not buying more than we need or buying things more than once because it's gone bad, but that savings is pretty minimal. 4. It's a lot of work. At first, I wouldn't have considered this a myth. But, now that I've gotten the hang of it, it's quick and efficient. Each month, meal planning and cooking takes less time. Morgan and I have a routine in place and it gets done very quickly. It's a little harder now with a newborn, but still faster than it was in the beginning. And if you add up all the time -- probably seven hours start to finish -- and divide that over the month, it's not bad at all. 5. You don't have to cook or shop once the big cooking session is over. 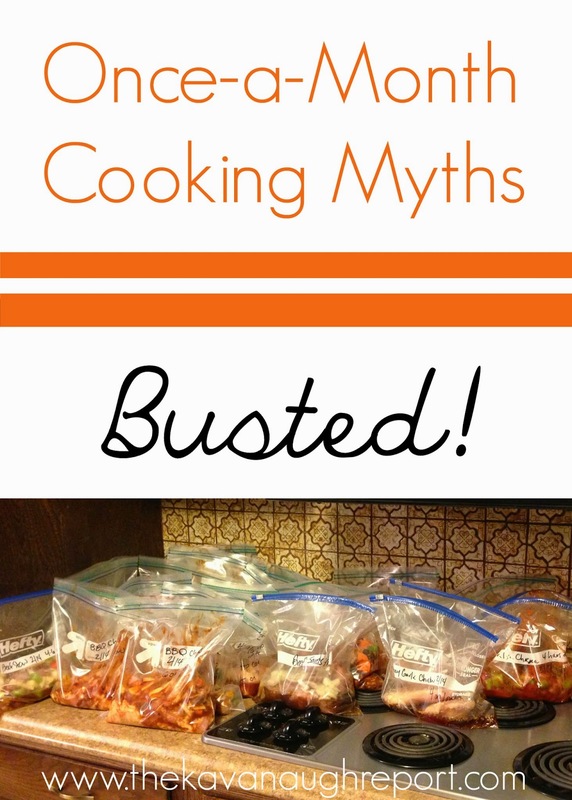 I think this is probably the biggest myth there is about once a month cooking. For us, we still cook and shop throughout the month. Cooking is minimal but sides still need to be prepared, as does the main course. Take, for example, chicken fajitas -- our dinner last night. During the main cooking session, the chicken is cooked, the peppers and onions cut and fajita seasoning added, it's then placed in the freezer. To complete the meal, on the night we eat it, I still make rice, corn and warm the tortillas in addition to heating up the fajita mix that we previously made. These are all simple tasks but it is still cooking, and it is still a pan or two to clean. This is true of most meals. Pasta needs to be made, fresh veggies cooked, and the meal warmed. Much of this takes under 15 minutes. As far as shopping goes, we still shop weekly for fresh produce, milk, bread, cereal and other staples. It's just easier for us to get this stuff on an as-needed basis then trying to guess how much we'll need for the entire month. But, these trips are much less costly and are very quick compared with our weekly trips before once a month cooking. 6. There's no flexibility. This just isn't true for us. If Morgan and I have a craving to eat out, we do. Or if friends stop by, we make something fresh (the meals are portioned for two adults and a small child). It's 100 degrees out and I don't want to heat up the house by cooking, no problem. T-ball runs late... Someone's sick... Nora's crabby... You get the idea. The great thing about the meals is they won't go bad that quickly. So, it's one less meal to plan for or make next month! We just add it to the beginning of the calendar next month and move on. It gets eaten, life moves on. Is anyone interested in specific recipes? I have gotten some questions about what we're making and I would be happy to share if there is interest. I'd love to see them too! Thanks! I'm definitely interested in knowing what you're cooking! With school starting back up shortly, I know I'm going to have to start cooking and freezing on the weekends if I want us to continue to eat healthy and have minimal stress in the evenings.